New Orleans. Even its original name Vieux Carré (“Old Square”) conjures myriad impressions. It is truly the westernmost European city and the northernmost Caribbean city, making it the most unique city in America. Only Montreal rivals it. (The Canadian city is invariably cleaner and better organized). 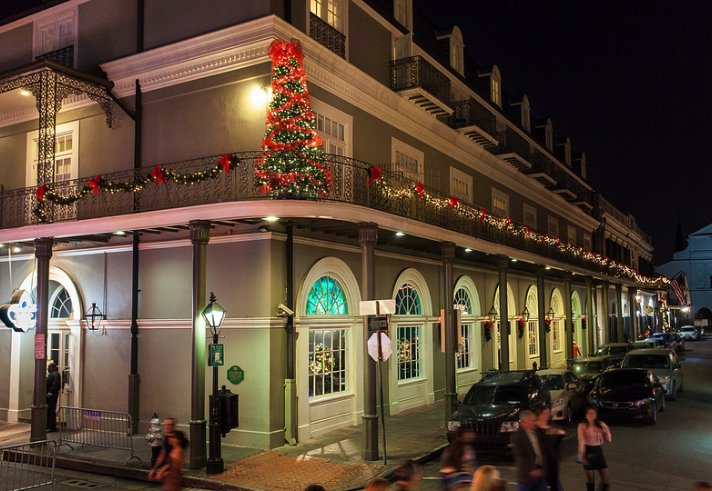 Just about geometrically in the exact center of the French Quarter is the Bourbon Orleans Hotel. A locally owned treasure, we enjoyed its charm and service for several days. Like much of New Orleans, the hotel has a colorful past. The building was once the home of Théâtre d’Orléans, the venue at the center of the city’s cultural and social scene in the 1800s. Over time the parties, dinners, operas and assignations were taken over in 1881 by the country’s first order of Creole nuns. 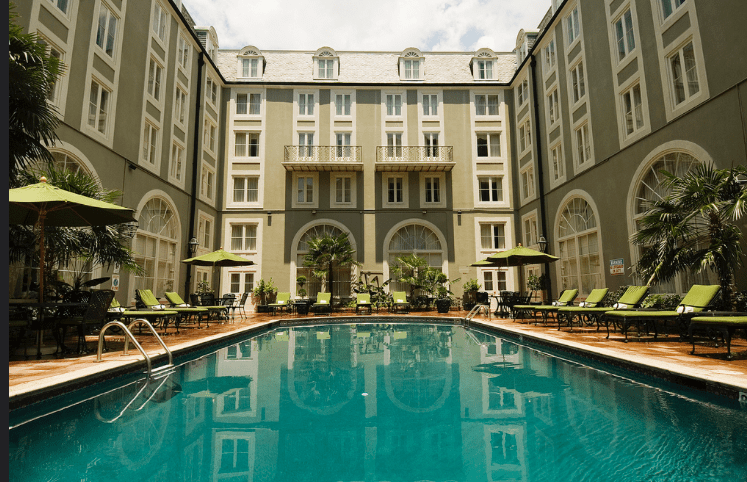 By the mid 1960s the nuns outgrew their home a half block from the funkiness of Bourbon Street, and the building was converted to an elegant hotel. Featuring 218 rooms, the hotel maintains its charming French origins. Our room opened to the inner courtyard with easy access to the saltwater pool, hidden from the street. Our room was elegantly appointed with a love seat, wet bar, separate bathroom and a writing table where I collected my thoughts. The beds were very comfortable, with luxurious linens and pillows. The lobby was arrayed with tapestries and comfortable sofas evoking the elegance of the past. 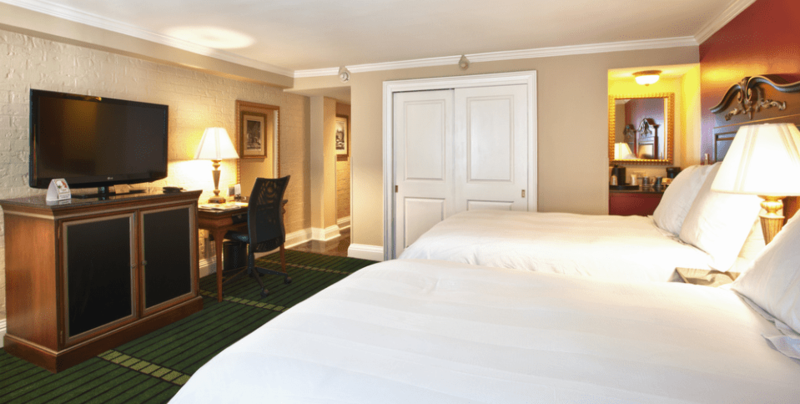 The hotel is situated equidistant from two of the French Quarter’s landmarks: St. Louis Cathedral and Jackson Square. The concierge pointed us in the right direction to partake of the city’s myriad activities. The Ghost and Vampire Tour in New Orleans is a great way to partake of the most ancient form of storytelling. We met as instructed at the Voodoo Lounge, and began our leisurely two hour stroll through the French Quarter as the night fell. Our tour guide Luke was an enthusiastic purveyor of local folklore, pulling us into stories about beheadings and bloodletting. The stories undoubtedly evolve with each retelling, and the veracity is open to conjecture. Best to enjoy a hurricane walking cocktail and suspend disbelief. The two hour walk around the French Quarter certainly took us to corners we would never have otherwise seen. For those who know their Marley family history, the designation of the restrooms will not be a surprise at the Rum House, a Caribbean Taqueria on Magazine Avenue. The crab melt sandwich was initially the choice (Louisiana crab meat, melted jack cheese, fried green tomato, spinach with a red remoulade sauce on a Cuban roll), but the informative waiter steered us to Caribbean inspired tacos. With a bit of trepidation (after all, we Californians consider ourselves pretty expert when it comes to tacos), we dove into jerk chicken, lamb vindaloo, calypso beef, Creole rib and the Carolina (pulled pork, jalapeño slaw, spicy vinegar barbecue sauce and roasted corn relish). Tacos like this deserve to be served in San Diego as well! Happily stumbling in at happy hour, we agreed that a Painkiller was the drink of choice (Pusser’s rum, pineapple juice, splash of OJ, cream of coconut and a surprisingly effective grated nutmeg garnishment). Back at the Bourbon Orleans Hotel we cooled off in the pool, and marveled at all the history within the several city blocks surrounding us. The hotel’s multi-million dollar renovation resulted in a delightful blend of modern conveniences and a reflection of historic heritage.